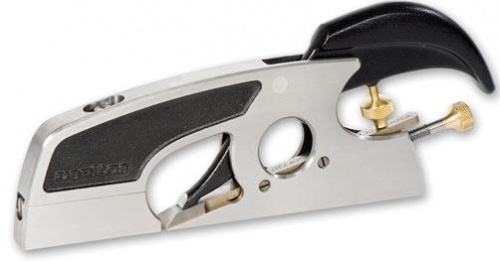 The Veritas Small Shoulder Plane is designed for one-handed use. It is a cross between a medium shoulder plane and a bullnose plane. The sole is 155mm long by 13mm wide and the plane weighs 500g. Its size makes it very useful for a multitude of tasks. Jobs such as trimming shoulders for a perfect fit to cleaning the bottom of dados are easily accomplished. The ductile cast iron body is accurately machined and finely ground. The sole and sides are flat and square, allowing the plane to be used on its side for accurately shooting tenon shoulders. The rounded lever cap and crowned back fit comfortably in the hand. The plane's micro-adjustable toe allows very fine setting of the width of the mouth for fine shavings and minimum tear-out. The low bed angle of 15° combined with 25° blade bevel results in a cutting angle of 40° giving exceptionally clean end grain cutting. Set screws along the side enable you to accurately position the blade perfectly flush with the side of the plane.